Regular feeding with lamb and rice has always been the traditional way to calm a dog?s digestion and help avoid allergic skin irritation. 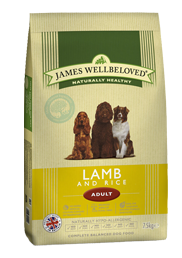 James Wellbeloved Lamb & Rice Kibble is a pure, natural, complete dry food of succulent lamb and brown rice. Barley is also added as a source of fibre and seaweed, alfalfa and yucca all bring health benefits. Ingredients: Rice, lamb meat meal, ground whole barley, whole linseed, lamb fat, lamb gravy, sugar beet pulp, alfalfa, sodium chloride, natural seaweed, calcium carbonate, chicory extract, lysine, D,L-methionine, yucca extract, threonine, JWB special ingredients. Contains: Min 26% lamb, min 26% rice, min 14% barley. Typical analysis: Protein 20%, oil 10%, fibre 4%, ash 8.5%, omega-3 fatty acids 1.1%, omega 6 fatty acids 1.1%.